Looking for Broil King Sovereign XLS 90 Review? Broil King sovereign XLS 90 is one grill that will give you a remarkable experience during your grilling moments. This grill takes the experience to another level. It has four main burners, on the side, there is another burner on the side and to rap it all a rotisserie burner which provides extra options to the user. Many users have praised the grill for its 1000 squared inches cooking space. Covered with stainless, the cooking area is easy to clean regardless of the type of food being grilled. Broil King sovereign XLS 90 grill is made to give value and exceptional service. Central surface has four stainless steel 9 mm with dual tube burners which ensure strong heat distribution for the 600sq inches of cooking area. The four burners give out at 50,000 BTU’s of heating energy which is a very good range of heat control. This grill has also a well build cabinet which one can store cooking and grilling tools, vegetable and any other spices needed for cooking. At the bottom there are two large wheels for support and some other small wheels which aid in mobility. The cabinet and shelves of this grill have been costumed to enable the user store the grilling necessities. One good thing about these shelves is the folding sides which hold things like snacks into good place. Design material is actually a combination of stainless steel and aluminium which are easily clean and are durable with no chances of getting rusty. The overall design of the grill is pretty appealing and you can be assured that your grilling experience will look technological with this grill. The lid will provide the good cover needed for cooking styles such as smoking. The side burners will also enable you to venture and get different grilling methods while still utilizing the main burners. In its design Broil King sovereign XLS 90, has an advantage in that it has easily controlled knobs which enable you to simply set your grill surface to exact temperatures for numerous different cooking styles. This grill has stainless steel Flav-R-Wave cooking system that vaporizes the juices of your meals to add a little bit of extra grilling flavour. Another good thing is that it has a sure light ignition system that lights up in once a need arises. 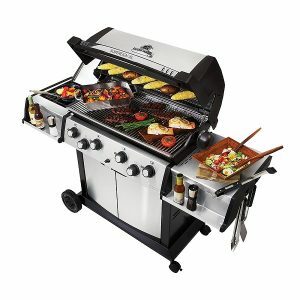 As a propane grill this system is good since the grill will heat up quickly and efficiently. 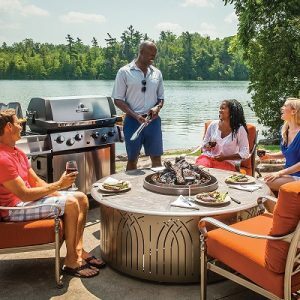 Another unique features is that the bottom has locking caster wheels which will allow you to stabilize the grill in an uneven ground or surface. A good grill comes with warranty and as a result Broil King sovereign XLS 90 has a limited lifetime warranty that covers the control panel, lid and housing. This is because these three parts is built with good material such as the stainless steel and aluminium. The manufacture has also given 10 years warranty on the stainless steel burners and the back rotisserie burner. This warranty is against all defects in material or workmanship. On others parts like the stainless steel cooking system, cart and cooking grates components are warranted for five years. While all remaining parts and paint is warranted for two years. In short this grill is made of quality and long lasting material. The cooking area is large (main cooking area 600sq and 400sq for the side burners.) The burners give a priority for the users to use different ways of cooking. The price is affordable and it’s a good deal for the service you will get. You can be assured that for some good numbers of years you will this grill without any disappointments. Finally the manufacturer has given good warranty to ensure you are covered against unnecessary faults like poor lids, control panel and defects in material. Broil King sovereign XLS 90 is one of the best grills in the markets.